How long should a carpet take to dry after cleaning? How Long Should A Carpet Take to Dry? 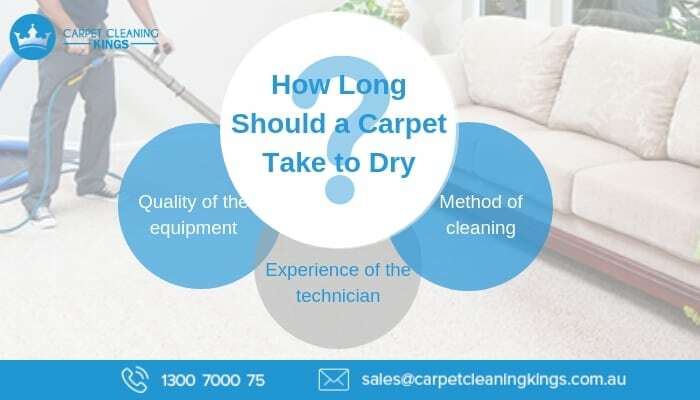 One of the most frequent questions we get asked by people considering professional carpet cleaning is “How long does it take to dry after cleaning?”. We’ve all heard stories about cheap cleaning companies who have cleaned an expensive carpet which has then taken several days to dry. At Carpet Cleaning Kings, we aim for all carpets to dry within 4-8 hours. Why does it take this long, and why is there such a variance in the time it takes? Another reason that some carpets take longer to dry than others depends on the amount of soil in the carpet. If the carpet is heavily soiled or it’s been a long time since it was last cleaned, then more cleaning solutions need to be applied to break down the embedded soils. This will loose and extract them than compared to a carpet that has been regularly cleaned. Temperature and humidity also play their part in determining how long your carpet will take to dry. If the environment is cold, it can take a lot longer for your carpet to dry. This is because the movement of heat and air causes moisture to evaporate faster than cold environments. Air that is humid doesn’t take kindly to even more moisture since it’s already full of it, so quick evaporation doesn’t occur. Warm dry air means that your carpet will dry quicker, think of your clothes dryer or hair dryer. When it’s set on high, it will dry your hair faster than on a low, cool setting. In addition, a carpet with long fibres such as a shag will take longer to dry than a carpet with shorter fibres. So why do times vary from one carpet cleaning company to another? This depends on a variety of factors including the method of cleaning, the experience of the technician, and the quality of the equipment. 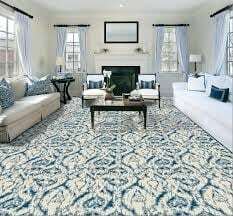 At Carpet Cleaning Kings our experienced technicians can identify all types of carpet in order to determine the best course of action for cleaning it, and the correct chemicals to use. Our state of the art cleaning truck mounted equipment is extremely powerful and as such, extracts as much water as possible from your carpets, so that they take less time to dry. We also come equipped with large blowers and fans to circulate the air and help carpets dry faster. With decades of experience in the industry and thousands of satisfied customers, your carpet is in safe hands with us.